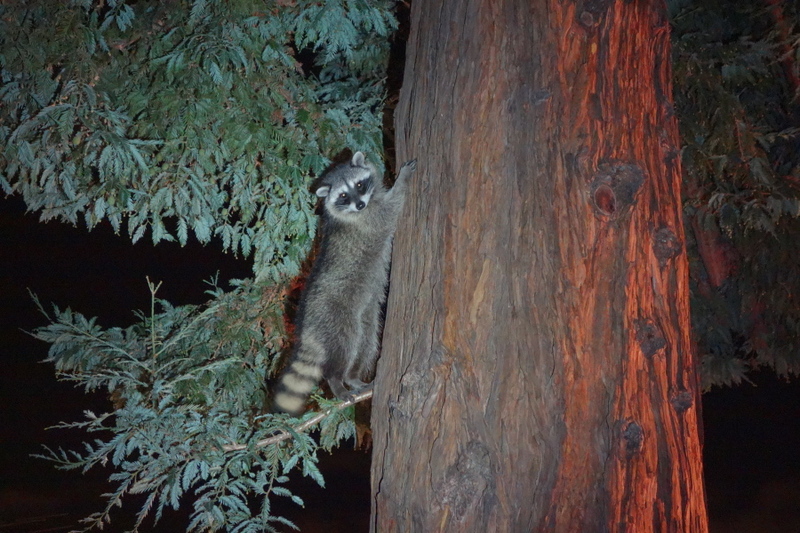 Raccoons are familiar night visitors in many neighborhoods. If we remove a raccoon to another location (which is dangerous and usually illegal) another raccoon will take its place as long as we provide what raccoons want: pet food, edible garbage, ripe fruit, grubs, and water. Raccoons also eat rodents. Raccoons are active at night. They sleep in tree cavities, spaces under porches, decks, buildings, and other dark, quiet areas during the day. Underground storm drains often serve as tunnels through which they travel. They nest between February and October. They are usually not aggressive toward people unless cornered, mating, or with young. Have patience when implementing the following suggestions, and remain calm. Work consistently and methodically to reach a lasting humane and effective outcome. Raccoons nesting under your house? In spring and summer, raccoons are raising their babies. Be careful not to separate the mother from her babies if she has made a den for them under your house or porch. Wait until the babies are old enough (8-10 weeks of age) to travel nightly with their mother before using light and noise repellents. When the young routinely leave nightly with their mother you can make their den area unpleasant by placing a bright light near the nesting area and playing a radio loudly during the day. You can turn on a mechanic’s trouble light and attach it to a board, then slide the board under the house or deck or into the attic. It may take as long as a week for the raccoon family to relocate as the mother may move only one kit per night. Wait until the whole family leaves on its own accord before nailing shut the nesting area. If the raccoons under your house are not raising young, you can flood the den area with light both day and night. How to know when the nearly mature young leave the den with their mother each evening. Sprinkle flour or corn starch outside the opening to their den. After dusk, if the raccoon family leaves its den, the footprints of both mother and mature young will show in the flour. Then you can close up the opening securely with 1/4” hardware cloth before they return. If you find that you have mistakenly placed a barrier between a raccoon mother and her babies, remove the barrier to allow the family to be reunited. Otherwise, the raccoon mother may damage the area when she struggles to return to her babies. Raccoons digging in your lawn? If raccoons are digging up your lawn they are probably looking for grubs (insect larvae that eat grass roots) under the sod. Fortunately, grubs will not permanently damage your lawn. Apply dog and cat repellent around the perimeter of the lawn and yard. Sprinkle the lawn with cayenne pepper. Flood the lawn area with light at night or use motion-activated lights. Set out shallow dishes containing rags or sponges soaked with ammonia around the perimeter of your lawn at night. Set out a motion-activated sprinkler such as ScareCrow or Spray Away. Activate it only at night in areas frequented by raccoons. Cover the lawn with woven wire so raccoons cannot dig into it. Grass can still grow through the wire and be mowed. Apply beneficial nematodes or a product called “Milky Spore” to your lawn to reduce the grubs. Both nematodes and Milky Spore are available at plant nurseries. Raccoons attacking your chickens, ducks, or rabbits? Chickens and other small animals such as domestic ducks and rabbits are extremely vulnerable to predators. They depend on us to keep them safe. Building predator-proof chicken, duck, and rabbit housing can prevent raccoon attacks that can traumatize your family and cause great suffering to your small animals. Find descriptions of predator-proof housing for chickens, ducks, and rabbits here or at Sonoma County Wildlife Rescue. Take basic steps to deter raccoons. Never feed raccoons or any wild animal. When raccoons get used to eating food provided by humans they tend to hang around and be more aggressive. Feed pets indoors, and put uneaten pet food away. Pick ripe fruit and collect fallen fruit. Enclose your garden area (but not the chicken area) with flimsy chicken wire that won’t support a raccoon’s weight. Continue reading for information on keeping chickens safe. Fasten garbage can lids securely — with a strap, if necessary. Close pet doors securely at night. Use taste and odor repellents that repel raccoons but do not harm them. Saturate sponges or rags with household ammonia and place them on pie tins or plates in areas frequented by raccoons. If raccoons bother your fishpond, cover the water around the circumference of the pond with one-foot wide chicken wire mesh, submerging it under the surface. It should be too unstable and flimsy to support the weight of a raccoon. Leave the center of the pond free of wire. If the pond is at least 3 feet deep in the middle, place some cinder blocks (the kind with spaces in them) there under water for the fish to hide under. Use repellents around the perimeter of the fishpond but not in it. After making sure that there are no raccoons or other wildlife inside your home’s attic or in the crawl space under the floor of your house, securely close all vent screens and other openings in those areas with 1⁄4-inch hardware cloth. Encourage your neighbors to take the same preventive steps as you are taking to deter raccoons. If you find a pile of raccoon feces, put them in a plastic bag. Close it tightly, and put it in your garbage can. Wear rubber gloves and wash your hands afterwards. Raccoons are carriers of Raccoon Roundworm, which can infect humans, pets, birds, and small mammals. Thoroughly clean, disinfect, and apply a raccoon repellent to the area where you found the feces. Do not try to touch, grasp, or closely approach a raccoon. Do not let your pets approach them. Keep your dog on a leash at night when you take it outside for bathroom breaks. Raccoons are wild animals with extremely sharp teeth and are likely to defend themselves. If you find an injured raccoon, contact your local wildlife rehabilitation center: National Wildlife Rehabilitators Association or wildliferehabber.org for advice.